Jonathan Pigram has spent most of his adult life living with bipolar disorder, and learning how to manage stress. He’s still on that journey, but has now reached the stage where he can share his experiences with other people who are struggling with mental health issues, and help them on the road to recovery. “I’m crossing that line between being ‘a mental health service user’ to helping others. And I love that”. While there were early indicators that Jonathan might be prone to the highs and lows of his bipolar condition – “I was a bit random when I was a kid, and they used to call me Mad Jon!” – he nevertheless went to grammar school, and studied for maths and physics A levels and an HND in design (communications) before achieving his ambition of working in television. Over the years, Jonathan, 47, has worked for three specialist TV stations, specialising in science fiction, children’s programmes and forces transmissions. He progressed from learning the technical ropes to managing the process of broadcasting programmes, advertising breaks and live presenters. It brought with it responsibility, and high pressure, working nights and weekends, and always to the second when timekeeping. Life became more difficult for Jonathan. He was in a relationship with a girl who had her own mental health challenges, and with pressures of changing jobs and buying a house he soon began to develop episodes of paranoia. “I honestly believed I was surrounded by cameras which were watching me”, he recalls. And so began a series of stays in mental health units in Surrey and Kent, including two months in a secure unit. He found some of the experiences and therapies beneficial, but hated some of the drugs he was prescribed,including the mood stabiliser lithium, which he has since found to have less side effects than the other medication he has been on. But he found the best medicine was throwing himself into his TV work. And so the cycle was repeated – pressure and stress, exacerbating his bipolar condition. “In September last year, the Maidstone team organised a five kilometre Fun Run to help promote World Mental Health Day. I wanted to get fit and lose a bit of weight, so I decided to give it a go”. 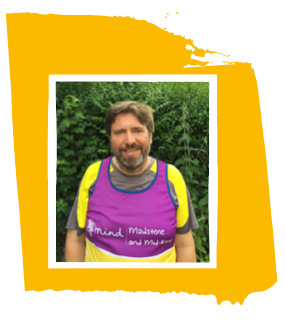 The initiative spawned a regular MMK Mind running club, and Jonathan remains an enthusiastic participant. Meanwhile, he’s been volunteering with KMPT in Albion Place, helping with the creative and recovery groups, and has completed their job taster scheme where he was able to get invaluable work experience in a mental health rehabilitation unit in Maidstone, assisting with group outings and encouraging the residents to take part in activities. But Jonathan is also being supported in his recove ry by someone very positive in his life – his Mexican fiancee Claudia, who even joined him on the 2016 MMK Mind 5k fun run. 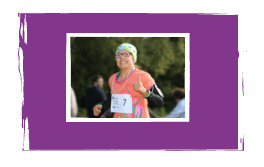 A keen runner herself Claudia will be over from Mexico this year to join Jonathan again for the 2017 fun run.